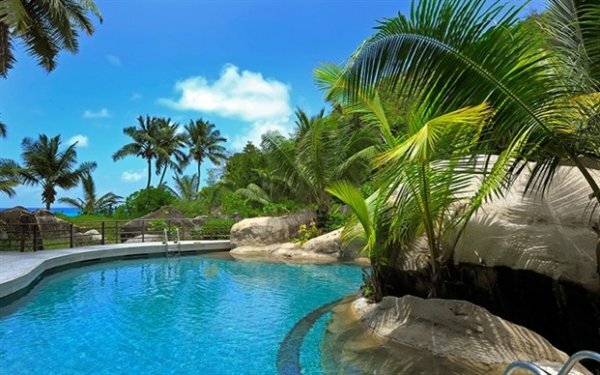 Constance Lemuria Resort of Praslin was the first 5 star hotel to open in the Seychelles. The resort is built in an idyllic location surrounded by natural vegetation that the owners have taken the greatest of care to preserve. The result is a unique and striking use of natural materials providing an ambience of true tranquillity and refined balance. 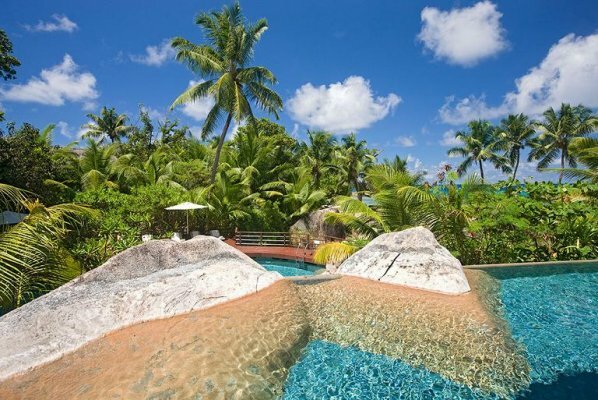 The pool cascades onto three levels, flowing down from the hotel and set in natural granite boulders. 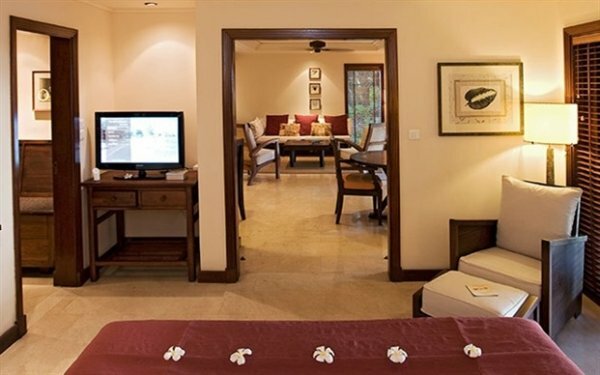 88 suites nestle between gently swaying palm groves. Each is furnished in natural materials of wood and stone. All are sea facing. Sprinkled along the beach front are eight senior suites. 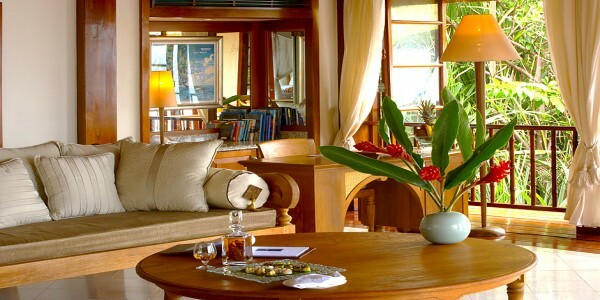 Each has its own swimming pool and villa master on hand, who will look after your every whim. 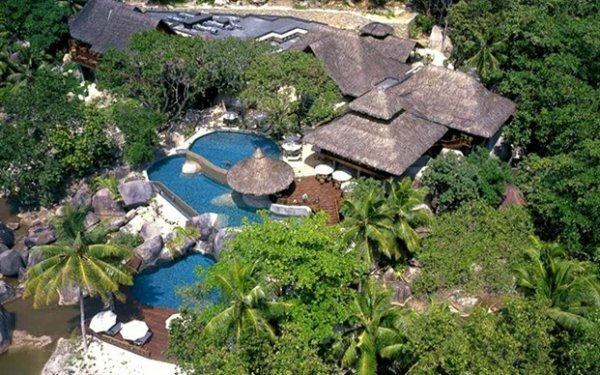 Constance Lemuria also has 8 villas each comprising 2 bedrooms and a relaxing, spacious lounge, while the dining room is surrounded by the swimming-pool. They offer the most comprehensive lodging possible. For unrivalled seclusion stay at the three-bedroom Presidential Villa with its own private beach and 3 tiered swimming pool. 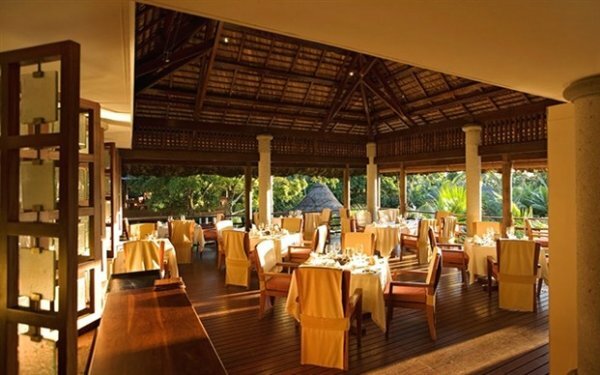 Three restaurants, located in three stunning locations, offer each a varied and quality style of cuisines from A La Carte menus to special themed evenings and 5 star buffets. Three beaches of pristine white sand fringe the turquoise ocean, where a multitude of water sports are available. There is also a fitness centre and Shiseido Spa, a kids club, tennis and an 18 hole championship golf course. This spectacular course borders the enchanting beaches of both the Petite Anse Kerlan and Grande Anse Kerlan. Seychelles are part of the legendary land of Lemuria. 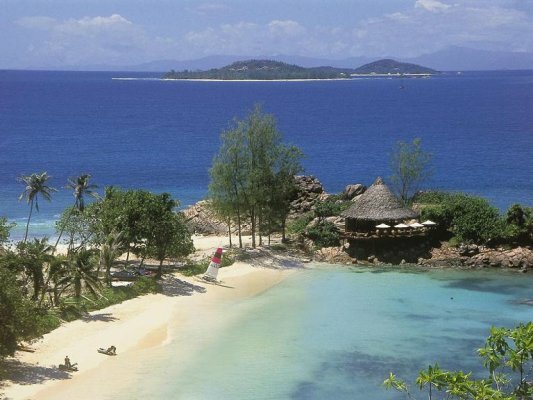 Constance Lemuria Resort of Praslin brings this fabulous legend to life. Energise body and mind with Shiseido’s Qi method in a place of exceptional beauty and comfort at the Shiseido Spa of the Lemuria Resort. True beauty comes from a harmony between body and mind meaning that cosmetic care should not only be concerned with optimal skin condition, but also total well-being. A perfect place for total relaxation. 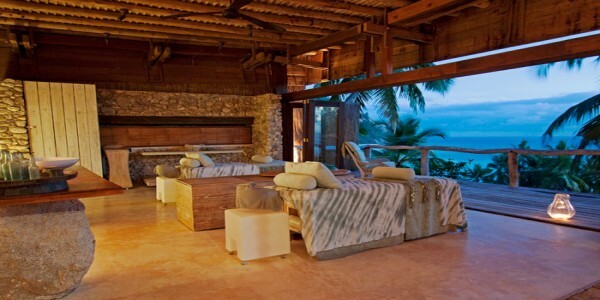 Discover the serenity and calmness of the treatments and massages, inspired from natural elements. This 18-hole championship Golf Course, a Par 70 was opened on 1st of October 2000, covering an area of 5,580 m. It offers a great challenge to all levels of players, professionals and amateurs alike. This spectacular course borders the enchanting beaches of both the Small Kerlan Cove and the Grand Kerlan Cove. Palm trees, allowing the light to intermittently filter through, fringe the first 12 holes. From the 13th hole, the course extends over the steep slopes of a thickly forested hill, with breathtaking vistas. – The golf shop, open from 7 am to 7 pm at the Club house, offers a wide range of golf requisites as well as a line of clothes specially made for the Lemuria. This is the main place of the building which is mainly a relaxation area allowing guests to wait during high occupancy or in case of late check out or simply chilling out during their stay. Amongst the facilities available are flat screen TV, DVD player, Internet access with wireless connection. Three computers with flat screens fully wireless, two libraries on wood shelves complete with magazines, books and DVDs, comfortable seating area consisting of leather sofa, chairs, armchairs and lounge round table and other furniture. Three bathrooms equipped with shower, washbasin, hair dryer and shaver, one luggage rack with granite top, one comfortable sofa and a round table as well as a separate toilet. All three bathrooms are named after Constance Lemuria famous beaches, namely Anse Georgette, Petite Anse Kerlan and Grand Anse Kerlan. Complimentary tea and coffee breaks are offered to all guests visiting or transiting at the VIP Lounge between 0800hrs to 2200hrs daily. The Conference room with a surface of 52, 80 square metres is equipped to a seating capacity for twenty guests only. It offers all top of the range in technologogical services and facilities such as automatic projector screen. (150 x 200), LCD video projector, 52’ flat screen TV and music sound system, wireless internet connection, and automatic decorative lighting. The “Turtle Club” is a multifunctional area comprising a games room and a dining area. It welcomes children from 4 to 12 years old between 9 am and 9 pm. Indoor and outdoor activities are organised daily as well as excursions such as, for example, the May Valley. A daily program is proposed under supervision and children menus are available on request. Baby-sitting can be arranged on request (payable). The hotel has 96 Suites, 8 Villas and 1 Presidential Villa, all oriented towards the Indian Ocean and spread over 150 hectares. 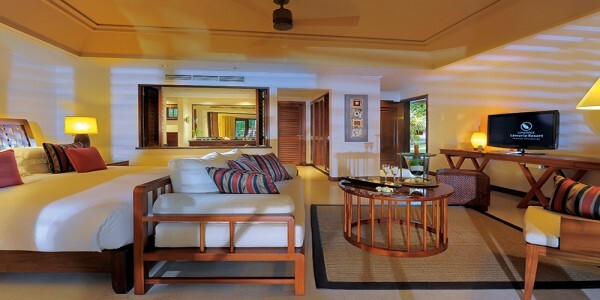 Each suite is positioned just 15 metres from the shore, discreetly nestled among the natural Seychellois gardens. All suites feature airconditioning, bathroom with separate bath and shower,bidet, toilets, hairdryer; tea and coffee facilities, minibar, safe, satellite TV, DVD, stereo compact disc and cassette player, telephone/answering machine. 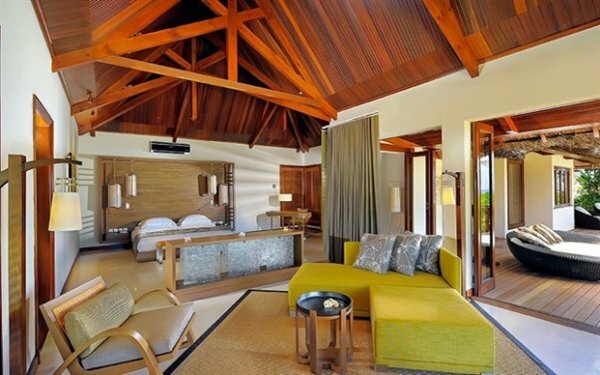 The 88 Junior Suites, constructed in wood, marble, stone and pink granite are located amidst the tropical gardens, in lodges all facing the stunning Indian Ocean sea. 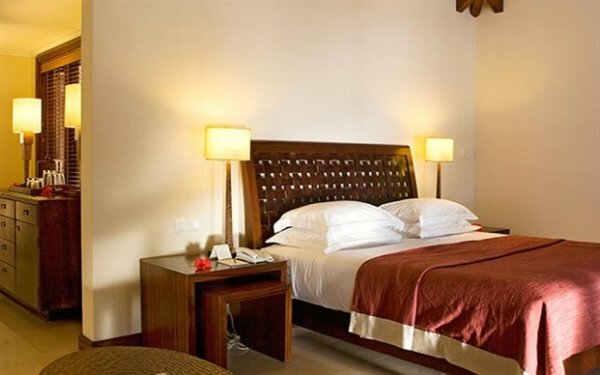 All suites are well equipped, the emphasis being on privacy, intimacy and harmony with the natural surroundings. 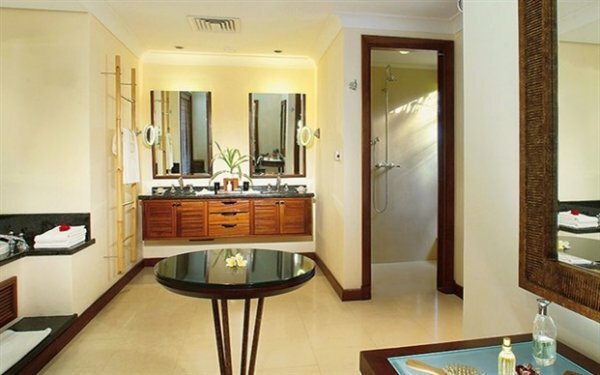 Each suite is designed along minimalist, yet luxurious style with ceiling fan, large bathroom, a terrace and sun lounge chairs in the shade of overhanging palm trees. The 8 Senior Suites located either on the groud floor or on the top floor are all exceptionally spacious. 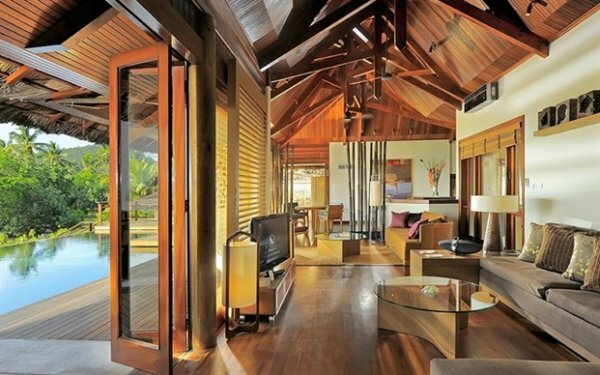 The suites were designed to blend in with the outstanding natural beauty of its surroundings. 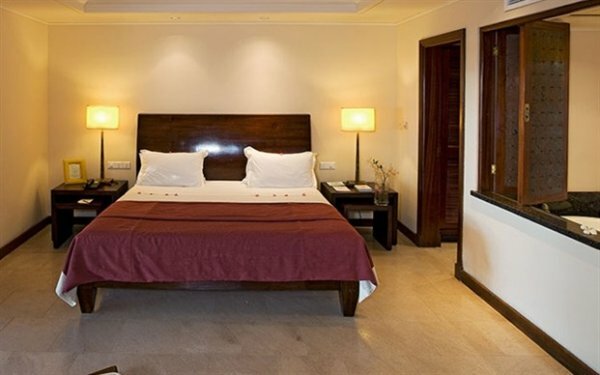 Each room has all the facilities as described for Junior Suites and, in addition, has a separate lounge with extra shower/toilet and a double size terrace. 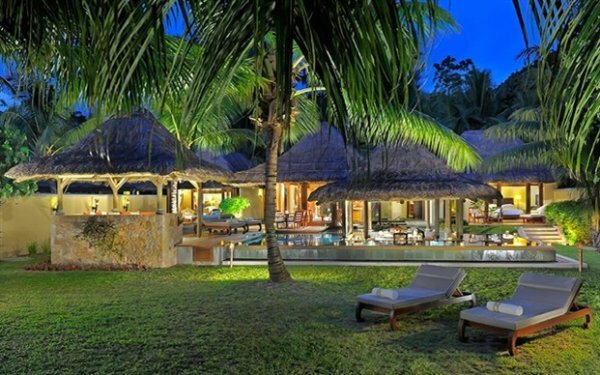 The 8 villas each comprising 2 bedrooms offer the most comprehensive lodging possible. These villas are also saleable as a one bedroom villa. 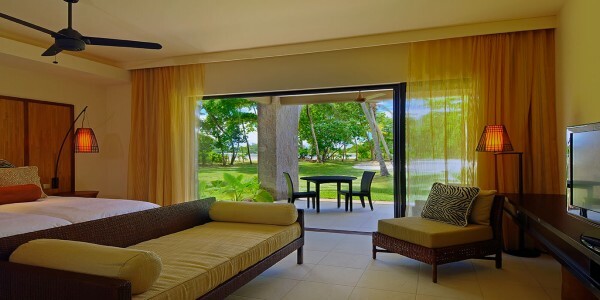 The bedrooms open directly on the gardens and on the beach. A lounge offers a relaxing space while the dining room is surrounded by the swimming-pool. Each villa has a Villa Master who caters for a customized and complete service aiming at transforming your stay into an unforgettable Experience. 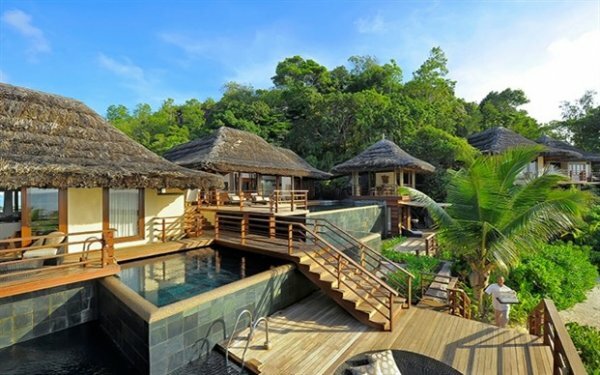 The Lémuria villas offer the same amenites as the Suites with, in addition in each room, a Sony Playstation (on request), a shower and an open-air bathtub as well as a massage kiosk. Majestically perched on the granite blocks of the southern tip of the Anse Kerlan stands the very recent Presidential Villa. A real private hotel within the resort, it has been conceived and designed to offer an absolutely unique experience. 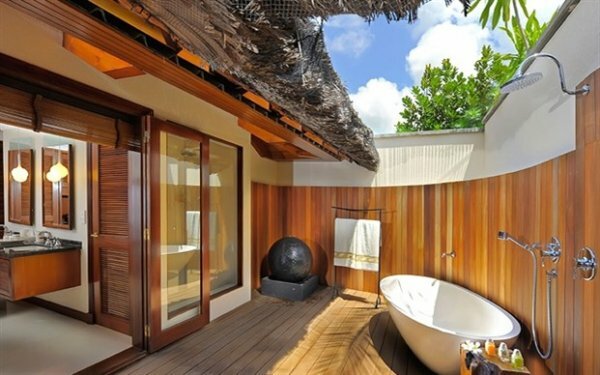 The villa consists in a master suite with its private bathroom and an outside Jacuzzi on the terrace as well as two other suites. Besides, it includes a study room, a lounge, a kiosk, a dining-room and three swimming pools at different levels leading to a private beach. 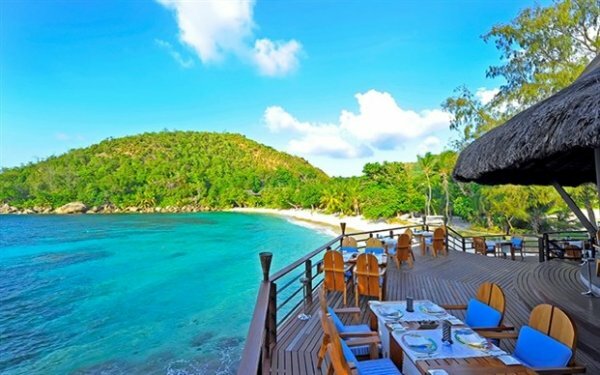 Constance Lemuria Resort offers a wide selection of French and international cuisine blending Seychellois flavours with traditional recipes. For lunch, the swimming-pool bar with its nice tables scattered by the waterside, proposes quick meals, sandwiches and salads composed with creole ingredients and seasoned with local spices. The warm and refined atmosphere of the hotel’s bars contributes to the total relaxation of our guests. The Legend restaurant, main restaurant of the hotel, offers daily breakfast buffet as well as dinner buffets and theme evenings. For lunch, it offers light dishes, sandwiches, burgers and pastas. Tantalize your palate with subtle gastronomy featuring authentic original exotic savoury preparations served in refined crockery. 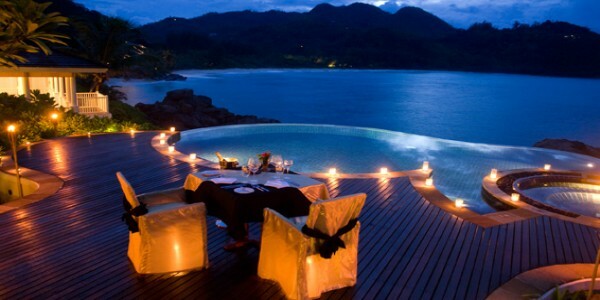 An ideal and romantic spot for a candlelight dinner. 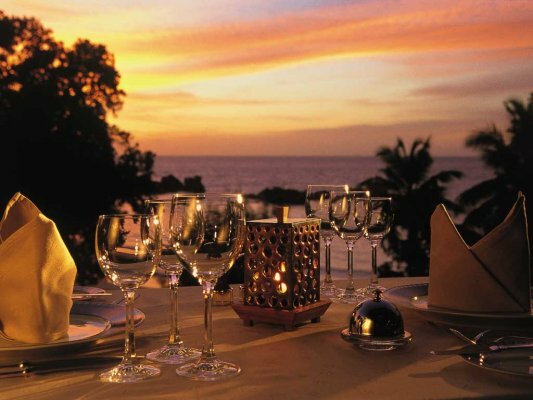 The Seahorse restaurant offers a contemporary Seychellois cuisine in a relaxed ambiance overlooking the golf course. The superb view of the 11th green fringed by a stretch of water reflecting the surroundings unfold in front of the restaurant is simpy breathtaking. 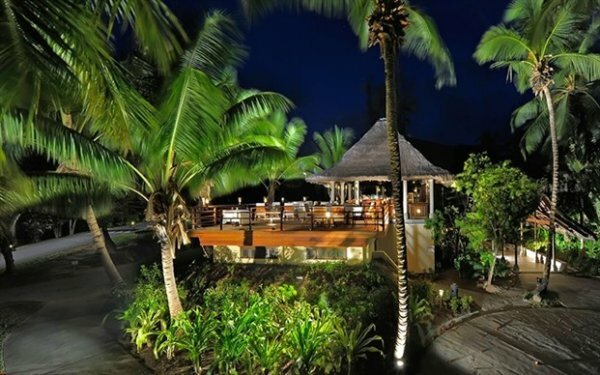 Overlooking the granite rocks bordering the beach, the Beach Bar and Grill is a seafood restaurant with a creole touch. Here, you can taste an ï¿½ la carte selection of the catch of the day, seafood specialities as well as an extensive ï¿½ la carte dinner menu while enjoying the breathtaking views of the Small and Grand Kerlan coves. Main bar situated opposite the restaurant, the Legend Bar is the ideal meeting-point for the guests during their stay as well as for the evenings with its quiet atmosphere. 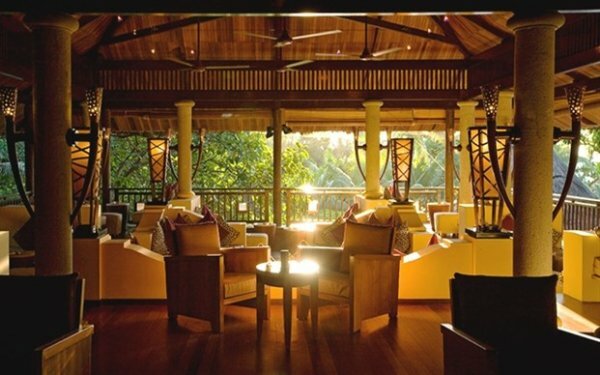 The bar is tastefully decorated with refined wood and natural ecru colours of African inspiration. A few metres away, in the hotel gardens, the Seahorse Bar, which is also the Golf Club House, offers a relaxed atmosphere. The Pool Bar is surrounded with a panoramic view on the calm and relaxing environment. Overlooking the beach, this stretch of almost virgin beach will entice you with its unspoilt, natural atmosphere and pure light. It’s really a world apart, rich in legends. This bar offers a selection of salads and snacks, cocktails and refreshments. You may opt for the cool shade of the Beach Bar. Perched on the granite rocks and just a step from the beach, with a breathtaking view of the two beaches, the Small and Grand Kerlan coves. This bar offers a variety of exotic fruit juice and cocktails.